The latest film from Martin Scorsese – who, at age 71, has pulled off a miracle – is a beast all of its own, the work of one of the greatest living directors who continues to re-invent himself. Remember, his last film was Hugo. Hugo. Scorsese, along with screenwriter Terrence Winter (Boardwalk Empire), have drawn from the pages of Jordan Belfort’s memoir of the same name and created a provocative, high-octane film that places an audience on the lavish frontiers of Wall Street stock broking. The images explode off the cinema screen, which is barely able to contain the relentless craziness within. The Wolf of Wall Street tells the story of Belfort (Leonardo DiCaprio), a young upstart broker who gains employment at a Wall Street firm in 1987. Following Black Monday, he is forced to reconsider his career path but his natural abilities lead him to an Investor Centre, sensationally dealing worthless penny stocks for high commissions with intimidating sales tactics. He eventually opens up a firm with his business partner, Donnie Azoff (Jonah Hill), and trains a team of average-Joes into super brokers. 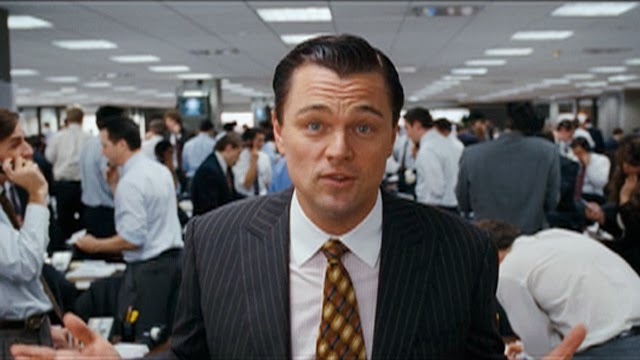 Soon enough every youngster out of high school is flocking to Stratton Oakmont to be taken under Belfort’s wing and learn how to become a millionaire. The film also tracks Belfort’s tumultuous marriage with his trophy wife Naomi (Margot Robbie), his offshore money smuggling in Switzerland and his lifestyle of total debauchery with his fellow ‘Stratonites’. Scorsese does a wonderful job of situating us within Belfort’s headspace but balances these personal addresses with a larger study of the lifestyle, which stems from a breeding ground for these money-obsessed sects. Scorsese utilizes some inventive storytelling touches, never losing sight of the self-congratulating angle of the narrative but having a noose ready at the same time. I came into this film having recently read Belfort’s memoir. I began to get worn down by his gloating recounts of his senseless debauchery, despite finding the insight into how he built the firm fascinating. I felt the novel was extremely indulgent and was skeptical about how Scorsese and Winter could craft an engaging tale from Belfort’s ramblings. The result is as an astonishing adaptation, the blueprint for that rare occasion where a film betters its source material.